I have used this photo of hosta ‘Crumb Cake’ emerging in spring before, but to me it epitomizes the beauty of a miniature hosta in a container. My nursery specializes in miniature hostas, and I have over 25 varieties available right now, both at the nursery and mail order. 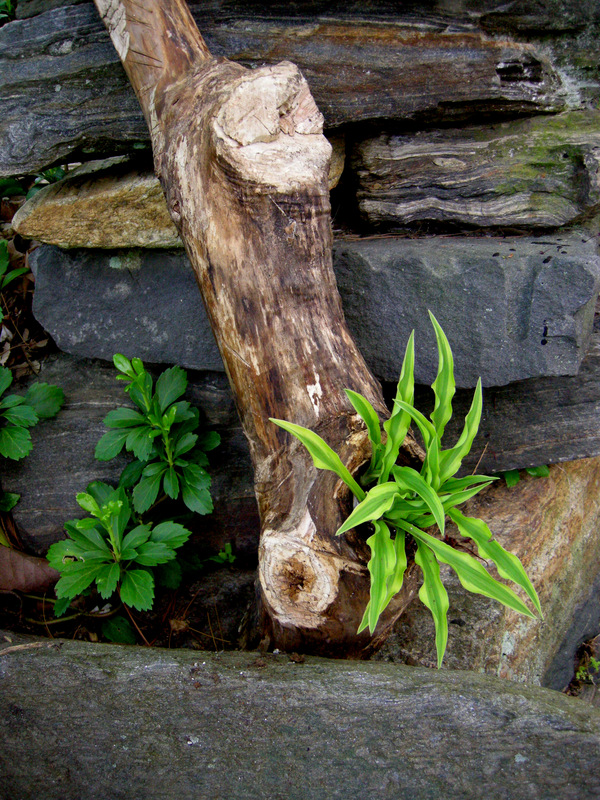 My 2011 post Miniature (& Small) Hostas gives an overview of little hostas and how to use them in the garden. 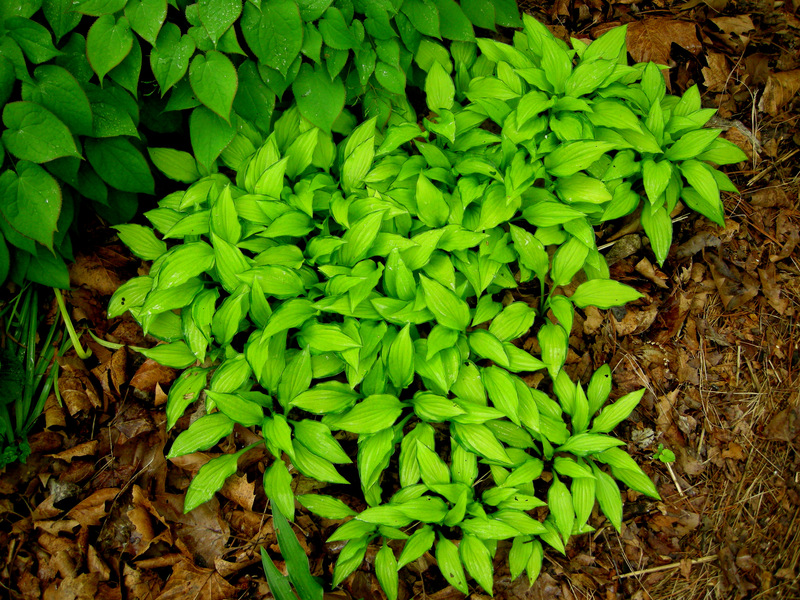 In my most recent post, I LOVE Mice, I raved about the mouse ears series of hostas. 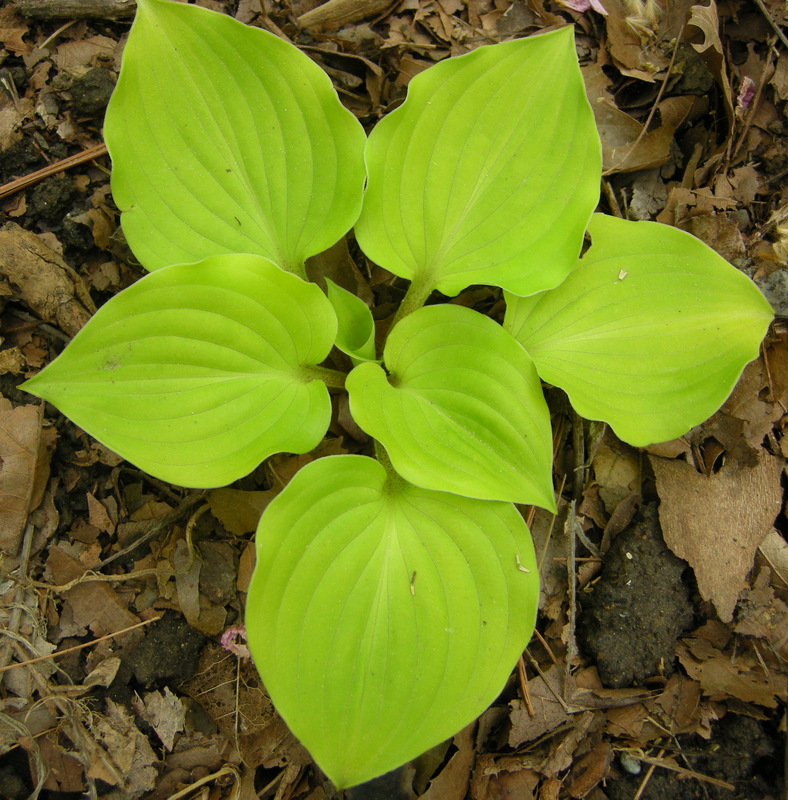 But there are many desirable miniature hostas “beyond mice” so I thought I would highlight some special favorites. 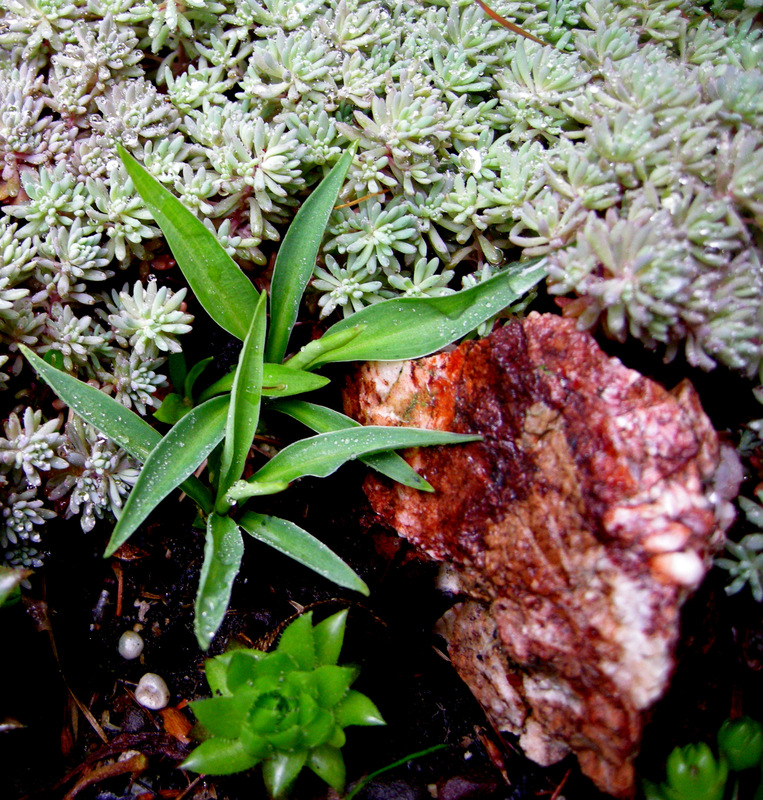 ‘Cracker Crumbs’ is pictured here in my dish garden (full photo below) surrounded by a tiny gray-blue sedum. It is a miniature hosta 5” tall by 19” wide with leaves 2 1/2” long by 1 1/2” wide. ‘Cracker Crumbs’ has shiny gold leaves with a bright green wavy margin and pale purple flowers in July. It quickly forms a dense and rounded mound and makes a great trough or rock garden plant. ‘Itsy Bitsy Spider’ is also pictured in my dish garden (full photo below) with the same sedum and some hens and chickens. 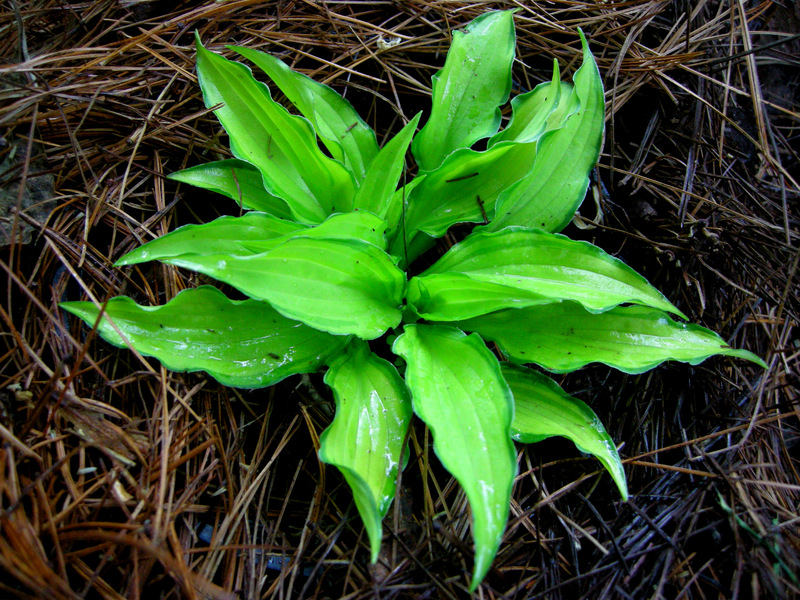 It is a miniature hosta 2 ½” tall by 6” wide with leaves 1 ¾” long by 1 1/4″ wide. ‘Itsy Bitsy Spider’ has narrow leaves with thick substance and a distinct blue-gray color, and pale lavender flowers in July. It forms a tight low mound. This adorable and rare plant is the smallest hosta in my collection. ‘Pixie Vamp’ in my rock garden—what a great name! 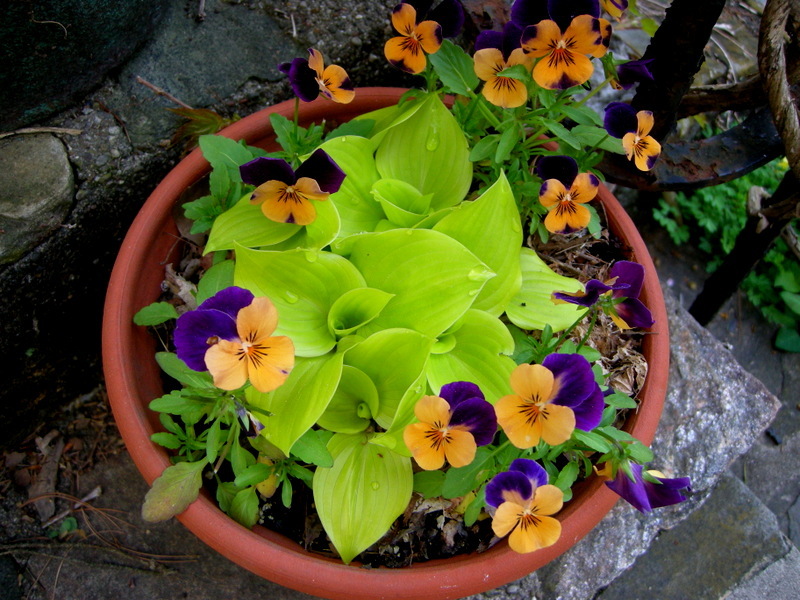 ‘Pixie Vamp’ is pictured here in a container with violas. 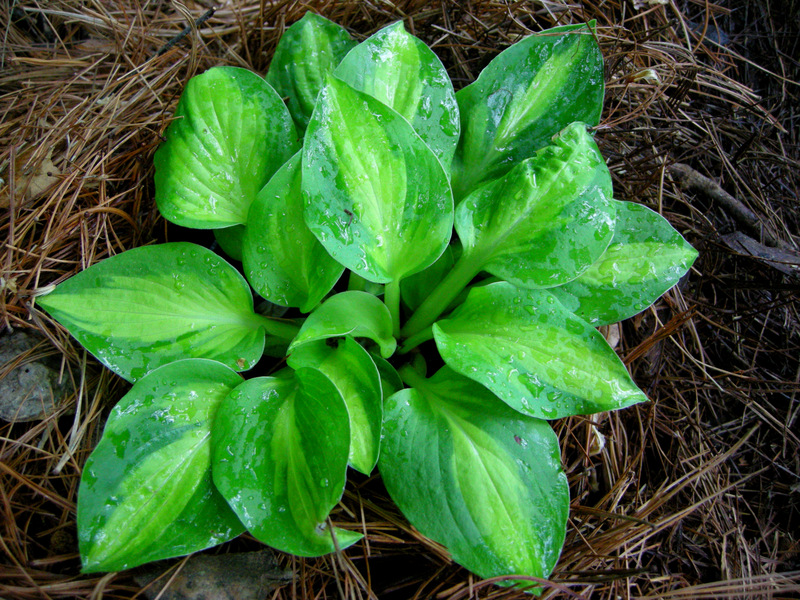 It is a miniature hosta 7” tall by 16” wide with leaves 3 ½” long by 2 ½” wide. ‘Pixie Vamp’ has bright green heart-shaped leaves bordered by gold in the spring changing to creamy white. Its gorgeous mahogany colored stems hold purple flowers in July. It is excellent in containers. The very unusual hosta ‘Crumb Cake’ in my rock garden. ‘Crumb Cake’ is pictured here fully emerged in the same container featured in the first photo in this post. It is a miniature hosta 5” high by 14” wide with leaves 3” long by 3” wide. ‘Crumb Cake’ is a recent introduction with very bright honey-gold leaves, which are round with wavy margins. 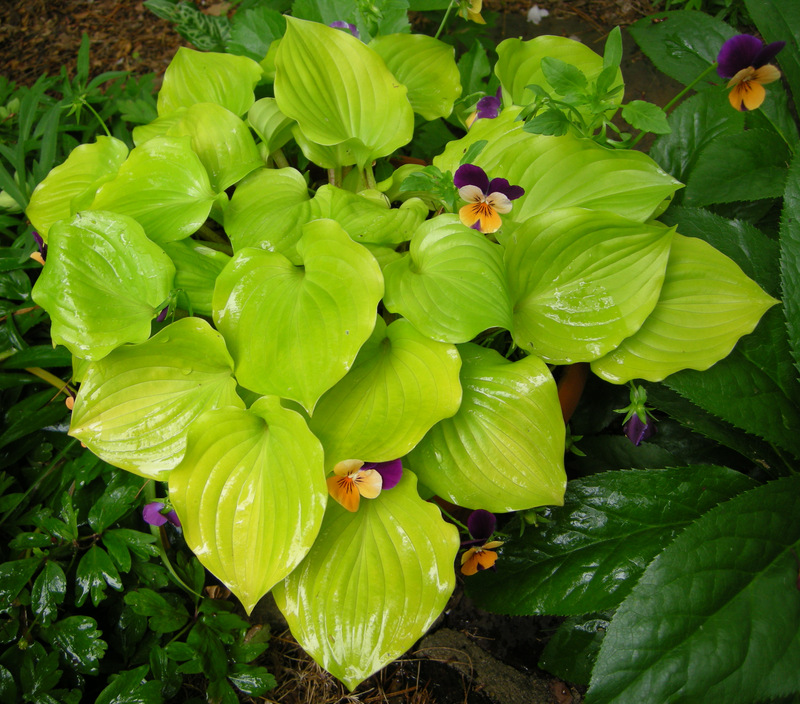 It is a very unusual looking hosta forming a flat, dense, brightly colored mound. It has elegant mahogany-colored leaf and flower stems and lavender flowers in July. It makes an excellent container plant. ‘Alakazaam’ in my rock garden. ‘Alakazaam’ is pictured here in a container made for me by my son. It is a miniature hosta 5″ tall by 10″ wide with leaves 6 1/2″ long and 3/4″ wide. ‘Alakazaam’ has bright green leaves with gold ruffled margins changing to creamy white, and lavender flowers in late summer. Its unusual spiky habit makes it stand out from the crowd no matter where you place it. ‘Surfer Girl’ is pictured here in my rock garden. It is a miniature hosta 6” tall by 18” wide with leaves 2” long by 1” wide. ‘Surfer Girl’ has dark green, sharply pointed, deeply rippled leaves reminiscent of ocean waves, and purple flowers in July. It creeps to fill in a wide area and is excellent for edging the front of a border. I use it in containers to contrast with gold-leafed minis. ‘Little Sunspot’ in my rock garden. ‘Little Sunspot’ is pictured here in my strawberry pot. 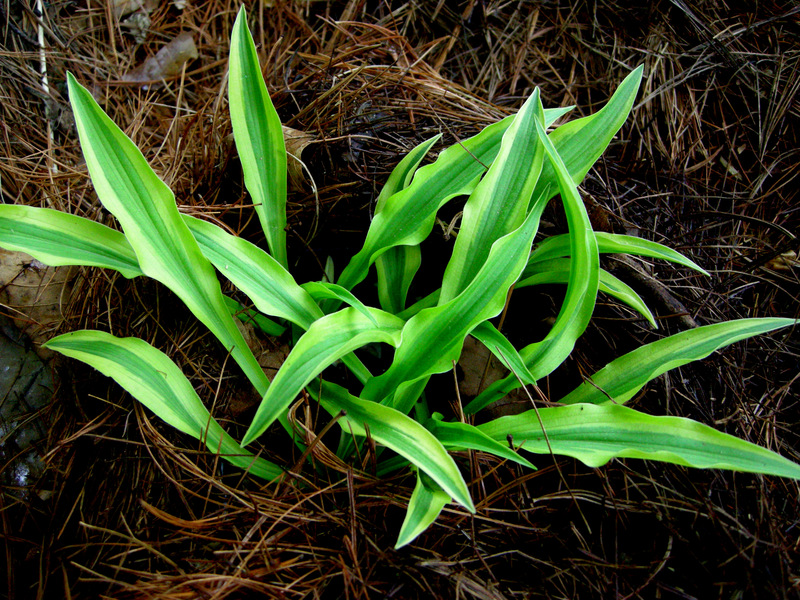 It is a small hosta 12″ tall by 12″ wide with leaves 3″ long and 2″ wide. 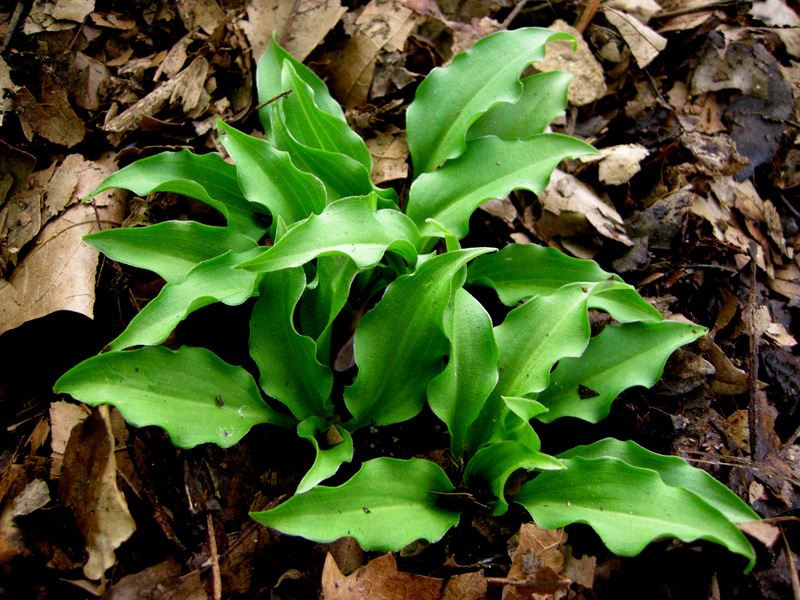 It has sharply contrasting variegated gold leaves with a wide dark green margin and purple-striped white flowers in summer. 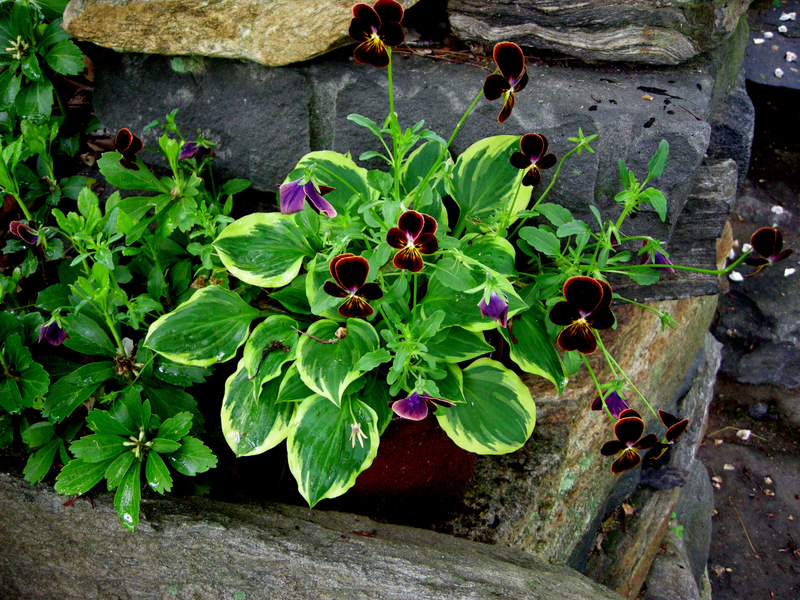 ‘Little Sunspot’ is great for a rock garden, border, or a container. ‘Twist of Lime’ in my rock garden. ‘Twist of Lime’ is pictured here massed in front of epimediums. It is a miniature hosta 6” tall by 10” wide with leaves 3” long by 1” wide. ‘Twist of Lime’ has bright gold leaves with a narrow, dark blue-green wavy margin and many deep violet-striped flowers in July. It has a beautiful upright habit and is a very fast grower—a favorite of my customers. ‘Praying Hands’ is pictured here in a container with violas and dwarf Solomon’s seal. It is a small hosta 16″ tall by 30″ wide with leaves 7″ long and 2″ wide. ‘Praying Hands’ has waxy and prominently ridged dark emerald green leaves with a narrow gold edge. 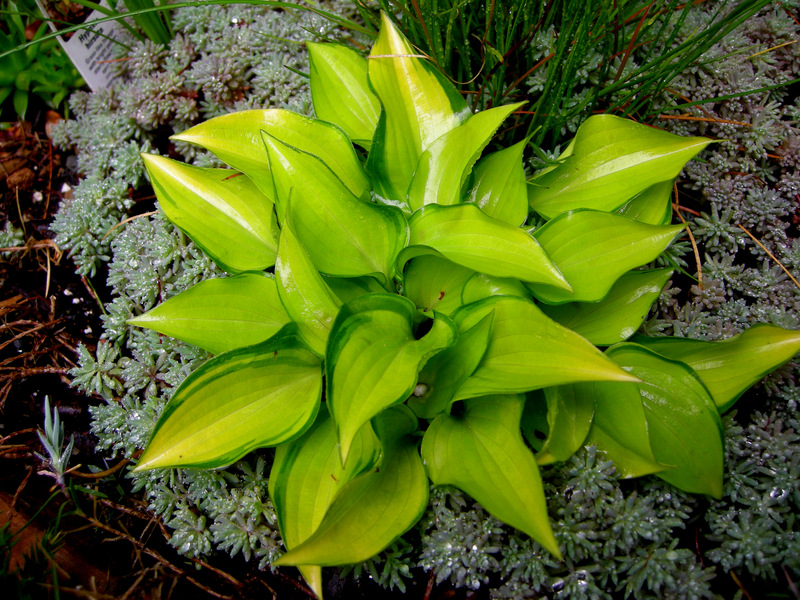 It is the most unusual hosta on the market with its folded leaves and vertical, twisty habit reminiscent of a pitcher plant. It thrives in containers with my plant doubling in size each year. ‘Praying Hands’ received the prestigious Hosta of the Year Award in 2011. ‘Praying Hands’ provides a vertical accent in my dish garden with miniature hostas ‘Shiny Penny’, ‘Itsy Bitsy Spider’, ‘Cracker Crumbs’, and ‘Shining Tot’ and various companion plants. Miniature hostas are so much fun. My next post will be on my new miniature hosta rock garden and feature companion plants to use in containers with your little hostas. This entry was posted on May 3, 2012 at 7:14 am and is filed under container gardening, containers for shade, hosta, miniature hosta, Shade Gardening, Shade Perennials with tags Carolyn's Shade Gardens, Hosta ''Alakazaam', Hosta 'Cracker Crumbs', Hosta 'Crumb Cake', Hosta 'Itsy Bitsy Spider', Hosta 'Little Sunspot', Hosta 'Pixie Vamp', Hosta 'Praying Hands', Hosta 'Surfer Girl', Hosta 'Twist of Lime', Hosta Shining Tot, Hosta Shiny Penny, miniature hostas. You can follow any responses to this entry through the RSS 2.0 feed. You can leave a response, or trackback from your own site. Do the hostas overwinter in the containers? The are sooo beautiful.Love “CrumbCake” and “Praying Hands”. So cute Carolyn. I just planted a Peanut hosta in my Fairy garden container. 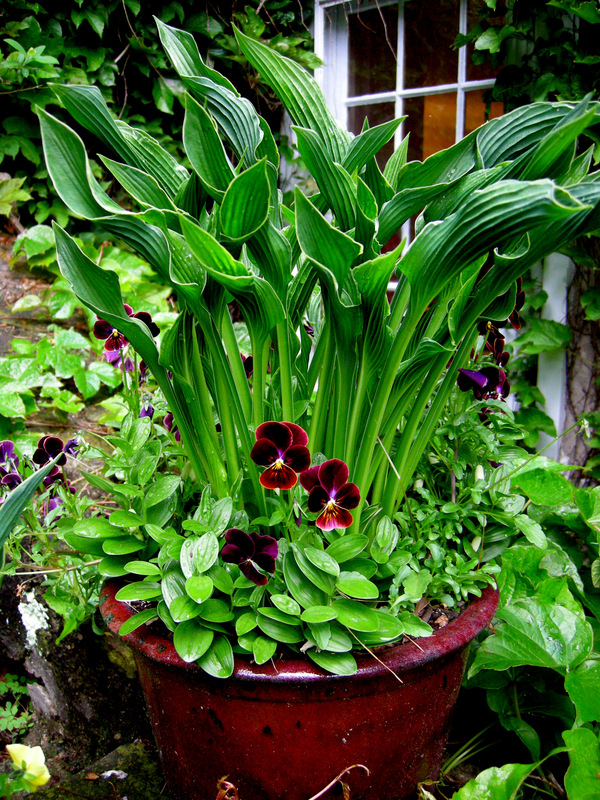 Do you protect your hostas that are in containers in some way over the winter or do they do well on their own? I live in zone 5b-6a. Thanks for showing us those images. I especially love the one showing a hosta growing out of a hollow in the tree limb. I’m not sure if it qualifies as miniature, but I was recently given some small pieces of Hosta Kabitan and I’m trying to find some interesting ways to use it. In a garden bed where a small Ilex ‘Sky Pencil’ looked incongruous surrounded by a sea of Heuchera villosa “Autumn Bride’, I cleared an area to make a vivid chartreuse carpet at the base of teh evergreen. Wish I lived near … I so love these, Carolyn! These mini hostas are precious! I just love the way you have them in the containers. Each and every one of them is amazing! Hi Carolyn, I have started to add some miniatures to my garden and I am already hooked! I really, really like all the textures and colors in your dish garden. The combination of the hostas and the blue-grey sedum is just lovely. 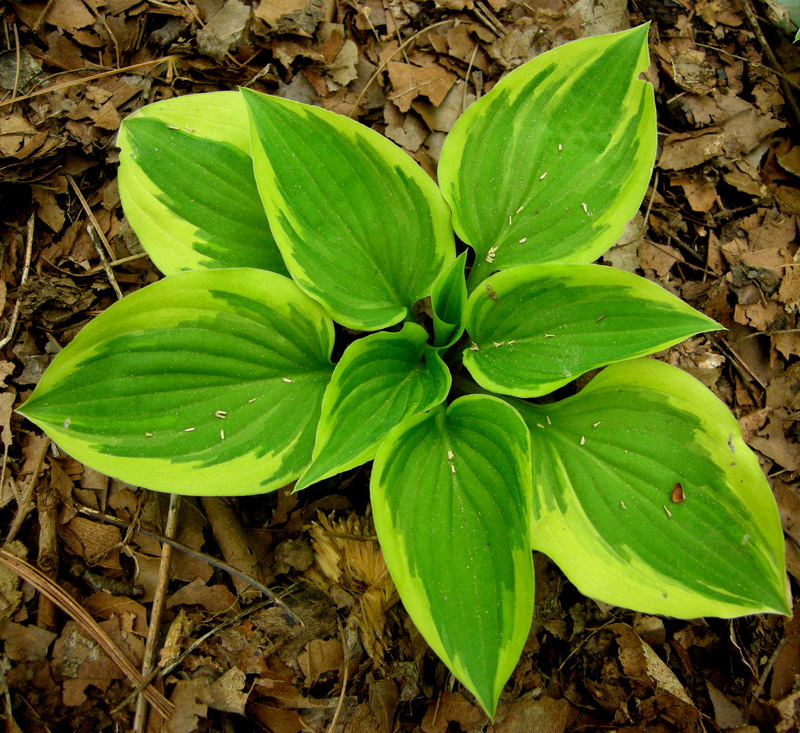 As chance would have it, I did my own post on hostas and added links to your last two posts at the end of mine under the heading “More Information and Links”. I was at a Master Gardener event recently and bought one Praying Hands, my first. I am looking forward to using it. I like the miniatures in the containers very much. They add so much interest. You have given me some good ideas. They work so well aesthetically in containers. 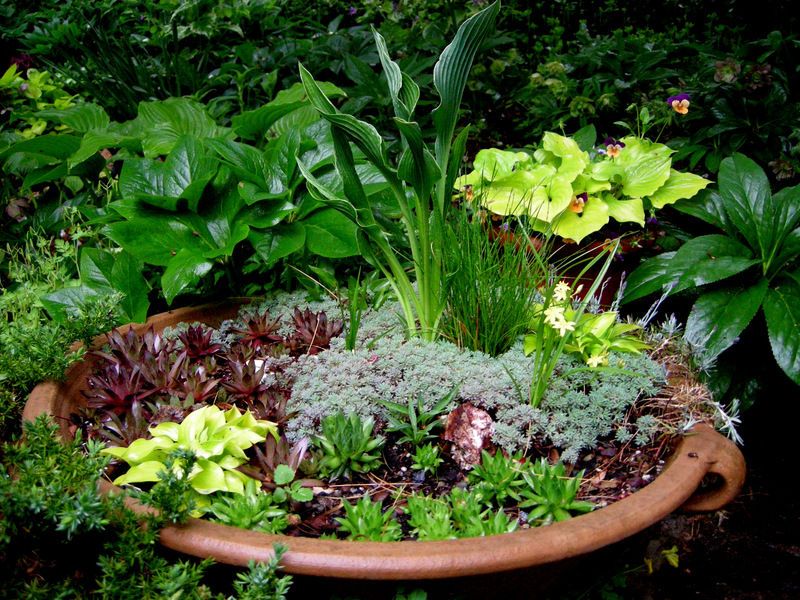 Your dish garden and container plantings are lovely. I find they spread readily in a well cared for container, so I bet you have to split them on occasion. I too leave perennials in containers outside over winter and have not lost any yet and we are 6B. My favorites are “Pixie Vamp” and “Crumb Cake.” I didn’t know much about miniature Hostas until checking out your posts. Thanks, I’ll see if my favorite nursery here supplies them. If not, you can order them mail order from me. 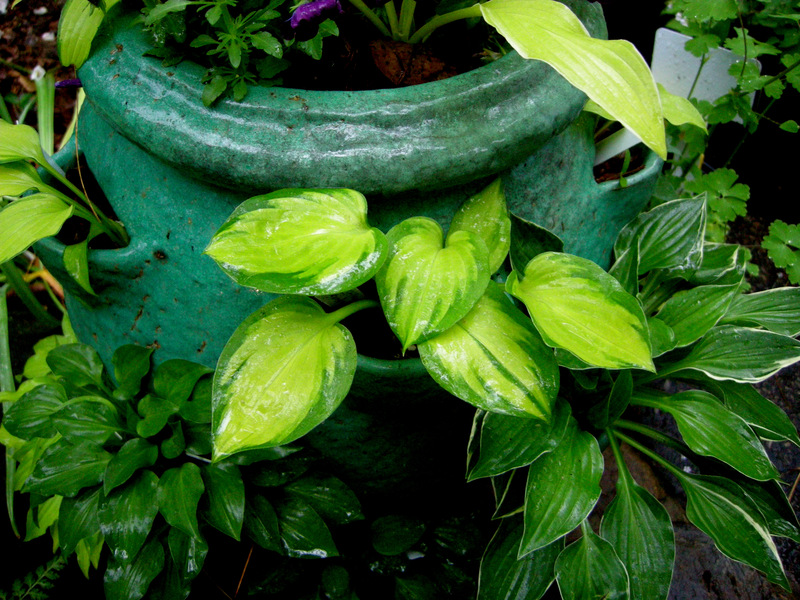 Great post Carolyn.I can’t imagine using miniature Hostas in my garden but in containers or hanging baskets they look fabulous! They work well in a rock garden or massed as a ground cover. ‘Twist of Lime’ has to my favorite with its spreading leaves. So pretty! Looking forward to meeting you in NC too! I had no idea there was such variation in hostas with both mice and miniatures. I’ve only ever really heard about the average size or really large hostas. Great review of all the possibilities available and ideas on how to use them. Yes Carolyn, your hostas are so beautiful, and made moreso with the presence of those pansies. We have a plant here in the tropics that looks like a hosta. In fact when i still don’t know its ID i thought it is a hosta. It’s Proiphys amboinensis. I love the dish garden, and I can see why ‘Twist of Lime’ is a customer favorite! I like the way you have demonstrated how these little hostas can be combined with each other as well as other plants for delightful combinations. I think that ‘Twist of Lime’ and ‘Praying Hands’ are my favorites… they both hold such garden design potential! As I look at your pictures I feel like I will need several more visits to your beautiful garden just to take it all in! So many wonder plants to see. But it is fun to recognize a few that I have seen in person! I am so glad that we made the trip. Your hostas are unbelievable, it is such a treat to see them grown well. I love your imaginative use of containers, too.